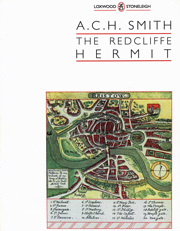 The Redcliffe Hermit is the most experimental play I have written. I tried to meld a number of preoccupations I had, all my bees in one bonnet. There was the history of the place. In the middle ages, Redcliffe was the residence of great shipping merchants, chiefly the Canynges family. William and Joan Canynges feature in the play, in a bad temper both of them. The outline of the stories about them I found in an old book of Bristol romances, possibly made up by that mischievous Redcliffe boy, Chatterton. It was a prosperous and busy place, and a medieval bookie might have laid you odds that in days to come the conurbation north and south of the river would be known as Redcliffe, with a suburb called Bristol. History did not go that way. The hermit was a real one. We know his name, John Sparkes, and that he was installed in his cave in 1346 by Lord Berkeley. The cave is still there, across the road from St Mary's. I imagined his religious devotion alchemising itself into a loathing of the upper class, and so into fundamentalist socialism, drawing on the Book of Revelation. But how could I use him as the telescope through which to view the centuries until 1941, when a bomb on Redcliffe Hill on Good Friday blew a section of tramrail into the churchyard of St Mary's, where the authorities have splendidly left it, embedded at an angle in the grass? As George Bernard Shaw remarked, plot has always been the curse of serious drama. The answer came to me from my amateur interest in quantum mechanics. I consulted a physicist friend, Bálazs Gyorffy. He invited me to a conference at the university to celebrate the hundredth birthday of Paul Dirac, who won the Nobel Prize in 1933 for his discovery of anti-matter. Dirac was born in Bristol, and educated at what is now Cotham Grammar School, which also, astonishingly, produced Higgs of the Higgs boson. When someone is lost in memory, or rapt in devotion like a hermit, they say: time stands still. That phrase can be taken seriously in quantum theory. Dirac liked to take long walks, so I had him walk from his home in Horfield, and in the 20th century, to argue about time and faith with my 14th-century hermit in Redcliffe. In the theatre, as witness pantomime, you may offer the audience an outrageous conceit so long as you stay consistent to its proposition. I hoped what I was writing was a comedy. Below is a once and future excerpt from the text. Once, because for technical reasons we cut it when Head Heart and 2 Fingers produced the play in 2005 in L Shed, Bristol, under the direction of Andy Hay ("funny, poignant and astonishing" - Bristol Evening Post), and so it does not appear in the as-performed text; future, because it will be restored in the next production. It is posted here, behind the scenes, because it captures, as well as anything in the published text, the tone and theme of the play. SCHRÖDINGER (suddenly appears) Mystics schmystics, what do they know about supersymmetry huh? Did they come up with string theory? Which if true requires that each string is a million billion billion billionth of a centimetre long. HERMIT Would that be an English billion billion billionth, or an American? SCHRÖDINGER What do they know, tell me? If you want to know how life on earth began, don't look for your answer in religious beliefs. DIRAC Though they might account for the end of life on earth. SCHRÖDINGER Try this one out on your mystic at home, that eight by nine is not equal to nine by eight. SCHRÖDINGER Sometimes it is, sometimes it isn't. It's quantum. This philosophy student, I was telling him about the principle of uncertainty, and him, he wants to show me that the Greeks knew it all, so he's quoting Protagoras back at me: "Many things hinder certainty - the obscurity of the matter, and the shortness of man's life." Whoa, I say, that is off. That is so far off it isn't even wrong. He wants to go on arguing, so I settle his sauerkraut. Ach, I tell him, so young, and already you are unknown. Philosophers, mystics, they're nibbling crumbs from the table of science. You see a world in a grain of sand? Try a million worlds and I'm interested. (To HERMIT) I tell you, sir, you think the trick is: know thyself. It's not. Nah. Not: know thyself, but: now thyself. What was, what might have been, what will be, they're not in the equation. All you got is the present moment, and you're a lucky man if you've even got that. I gotta go feed my cat. Well, maybe. Cost (including postage): UK £6.50 / Europe €8.60 / USA $13.70. Cheques made out to Falling Wall Press. Alternatively, signed copies are available to buy here online.